I always love a new technique for decorating a cake. Sometimes they are only new to me, but I still love them. The newest idea (that I know isn't new) is frozen buttercream transfers. 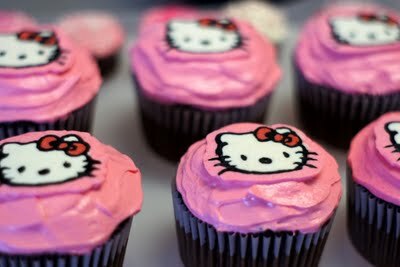 I had never even heard of it until I saw these cute Hello Kitty Cupcakes on Gretchen's blog. She has a great tutorial showing how she created her frozen buttercream transfers over on Where is the Laugh Track. And if you want to check out some other cake decorating tutorials, I would suggest diy icing combs, how to frost a cake, and how to make marshmallow fondant.